Sacred Music online radio station came to us at Coderra seeking a total website revamp with a range of interesting requests that would flex our technical muscles and really test our coders’ abilities. The original site of the internet radio station didn’t work properly, and wasn’t responsive – something classed as sacrilege in the world of websites today! Sacred Music needed Coderra to bring their existing site into the twenty-first century without losing any of the identity they have cultivated since the station was founded back in 2003. 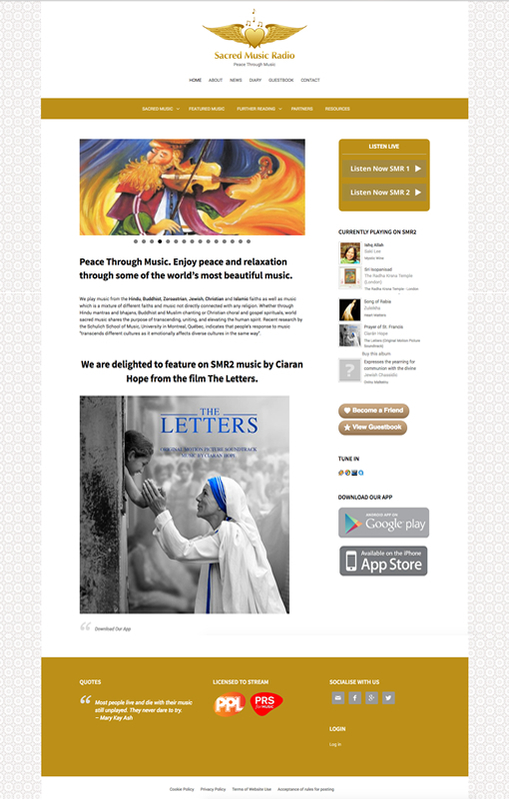 The team at Sacred Music called us in to overhaul the site with a brand new WordPress theme, which we did. Sacred Music already had an established brand and logo, and weren’t interested in changing or altering any part of this reputable image, so we created a site which conformed to their existing brand colour scheme of gold and white. There were a variety of pages and sections which we needed to include, from the guestbook and the diary to the ‘Featured Music’ section, and we’ve managed to keep the navigation very simple so that all of these areas are totally accessible. In contrast to the old website, the updated site is now totally responsive and easy to navigate. The team at Sacred Music can also manage the site much more easily, posting news and blog posts, as well as keeping their diary and guestbook up to date. Two of the biggest challenges we faced on this project were implementing Centovacast and Shoutcast onto the site. Both of these features involve streaming music and taking requests from users, and as you can imaginge, the coding was quite complex. Nevertheless, our fantastic team pulled it off with aplomb, and users can now stream and request music directly through the Sacred Music online radio website. We love a challenge here at Coderra, and we were especially pleased with how this project turned out – we hope to work with Sacred Music online radio again in the future!